→What are the Best Acoustic Guitar Strings? 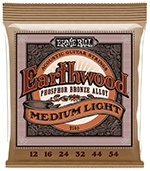 Looking for the best acoustic guitar strings? Strings are an integral part of the overall tone of an instrument. The right strings can make a guitar sound vibrant and alive. They can add the extra bit of bite to chords and allow notes to resonate longer. Buying the right strings is important; each string brand has numerous choices, from coated strings to classic nickel plated steel strings. Choosing the correct set of strings for your acoustic guitar will be a process of trial and error, however there are certain features you should look for in any set of strings to ensure that you get the most for your money. If you are in a hurry, and before we get into more detail about what to look for to find the best acoustic guitar strings for your instrument, lets have a quick look at our top 5 strings that we feel would are the highest quality and are most often picked by acoustic guitarists. For more information on all 5 of these acoustic guitar strings, just skip to the end of the article. Longevity is the most important aspect of a set of guitar strings. The longer a set of strings lasts, the less money you will have to spend over time buying new sets to replace the old, worn out sets. 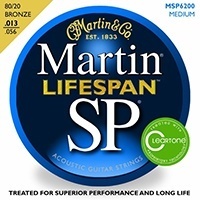 Longevity is a relative term–not all strings will last the same; some will erode much quicker than others, and some will require actual maintenance in order to preserve them. Coated strings are a relatively new concept. Within the last fifteen years, strings have been made with a variety of coatings, each of which is designed to preserve the feel and integrity of the string. Coated strings are less likely to erode quickly and are more likely to last the longest in terms of breakage–without erosion, breakage becomes a matter of force rather than fragility. Coated strings do tend to have a different feel to them than non-coated strings, and some can take getting used to due to their waxy texture. Nickel wound strings are the most common and most used strings available to date. They are cheaper than their coated counterparts, as they are cheaper to produce. The problem with uncoated nickel wound strings is that they tend to rust fairly quickly if proper care is not taken of them; most guitarists wipe their strings with a microfiber cloth after each playing session to avoid the salts and oils from their fingers eating away at the strings and causing rust. Some even use special solvents and solutions to keep their strings sounding crisp and preserve them even longer. The gauge of the string set has a potentially large impact on the strings’ lifespan. For players who tend to use more force, or bend their notes more sharply, lighter gauged strings may have a tendency to snap quicker than heavier gauged strings. A string gauge that is too thick will last much longer, but will not allow for good vibrato or resonation, as the thicker strings will require too much effort to fret. So which acoustic guitar strings are the best acoustic guitar strings for you? Picking the perfect string set is going to be a process; personal taste plays a large role in finding that ‘magic’ set suitable for your acoustic guitar needs. String gauge, and the choice of coating (or no coating at all) will come down to player preference, however there are a handful of player’s choice strings that are renowned not only for their crisp sound and pleasant feel, but also for their top quality. Any of the following string sets will be a great starting point and comparison point in your search for the perfect acoustic guitar string set. Now let's have a look at the top 5 acoustic guitar strings that we have chosen in more detail. 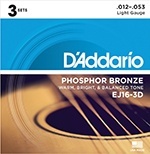 For most beginner acoustic guitarists, D’Addario is the perfect string choice. In a time when you are learning the precise feel of the instrument and discovering how to properly pick and bend your notes, these cheaper, smoother strings are the perfect choice. The EJ16 Phosphor Bronze are D’Addario’s most popular acoustic guitar string set. 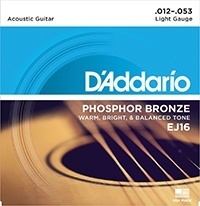 D’Addario prides themselves on these strings’ warm, balanced and bright tones. The EJ16’s are available in a 1 pack, 3 pack or a 10 pack as well as in Heavy, Light, Medium, Bluegrass, Custom Light and Extra Light styles. These strings are also packages in a sealed, corrosion-proof, recyclable plastic covering to ensure that the strings get to you in the freshest form they can be. Ernie Ball strings are simple, but they have wonderful feel and a vast variety of gauges. If gauges tend to be a problem for you–most sets are too light or too heavy–Ernie Ball is the solution string, as they offer some of the most varied string gauges on the market for a decent price. 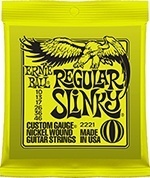 Ernie Ball 2221 Regular Slinky Nickel Wound guitar strings are known for being the favorite string of famous rockstars such as Slash, Jimmy Page, Metallica and Eric Clapton. These strings are available in gauges of .010, .013, .017, .026, .036 and .046. 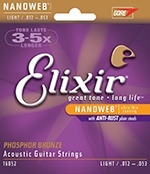 The Elixir Nanoweb series of strings is one of the most popular acoustic guitar string choices. With a special Nanoweb coating designed to prolong the life of the strings up to 4x longer than average nickel plated strings, Nanowebs are perfect for those who want to avoid buying strings every month and simply put on a set and play to their heart’s content. Like any coated string set, the Nanowebs can take some getting used to–they tend to feel a bit satiny to some, which can be off putting. 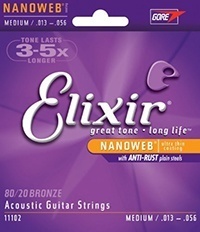 Nanowebs are a bit pricey at about $15 a set, but the higher cost absolves itself in the long run as you will find yourself changing your strings far less than usual, as the special Nanoweb coating keeps these strings sounding bright and crisp for months. 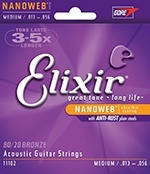 These Elixir strings are available with Nanoweb or Polyweb coating. 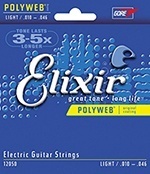 See below for the Elixir Polyweb review. Like their coated counterparts the Nanowebs, the Elixir﻿ Polywebs are also some of the most popular acoustic guitar strings on the market, and with good reason. The Polyweb strings have a thinner coating than the Nanowebs, which makes them far more agreeable with most players’ fingers. The Polyweb coating, like the Nanoweb coating, can keep a guitar sounding newly stringed and clean for months longer than average uncoated strings. 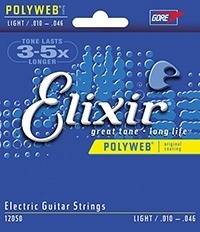 The Elixir Polyweb are sold as electric guitar strings but can be used on both electric guitars and acoustic guitars. Martin SP’s fall in to the same category as the D’Addario strings–they are simple, cheap, and perfect for beginners or anyone who dislikes coated strings and tends to be a bit rough on their instrument.